Now that you have the tune from Journey running through your head, let’s talk about how you are going to protect your data with encryption and key management. So you have all this sensitive data that you need to secure… how are you going to protect it? What kind of key management choices do you have? How do you decide what encryption to use? Just how do you decide what you need, and where you will put your key management device, and will it be hardware or virtual? In many cases, regulations require you to protect sensitive information. Beyond being a compliance requirement, it is also a responsibility to your business and your customers. We understand all those questions can be a bit daunting at first, but there are a variety of encryption key management options to choose from. The main consideration that will be determined within each of the following factors is your Risk Tolerance. What kind of sensitive data are you storing? What will happen to that information if there is a data breach? What will the impact be to your company, to your customers, if that information gets accessed by the wrong people? What are your liabilities? No matter whether it lives in a single PC hard drive or a vast data center, or even in a shared cloud environment, the type of information you need to protect will have a large impact on what level of risk tolerance you have. Infrastructure: Where your data lives (client side application) determines what kind of options you have. Is your data all in one location (on a PC, or in a data center)? or is it in the cloud? or a combination? Are there requirements that would limit where your key server could be located? How will data need to be transmitted from one location to another? Once you have a clear picture of the sensitive information you are responsible for then you can move on to the next set of questions. Compliance Regulations: If you are dealing with Personal Identifiable Information (PII) or Protected Health Information (PHI) or Payment Card Industry (PCI), you have a great responsibility to protect that information and meet different compliance regulations. Depending on what industry you are in and where you live, different regulations may come into play. If you take credit card payments, you will certainly fall under PCI-DSS and be required to encrypt that data. If you are a part of or even partner with the medical sector then you also need to comply with HIPAA/HITECH Act requirements for security of Protected Health Information (PHI). GLBA/FFIEC sets regulations for banks, credit unions, credit reporting agencies, and anyone in the financial industry. FISMA is for Federal US Government Agencies and businesses that partner with them. The Federal Trade Commission (FTC) also gets involved with anyone who issues a privacy statement. On top of those regulations, more than 45 states also have their own privacy rules that strongly recommend encryption of any personally identifiable information (PII). Availability: Beyond just the availability of your encryption key management options, think about how many people need access to your data. What kind of security procedures do you need in order to keep the wrong people out and yet allow the right people to do their jobs? Will you have a key management system that supports separation of duties and dual control of your encryption keys? Cost: Your budget will also determine what kind of key management system you use. While cloud options may present a cost savings, you would potentially need a higher risk tolerance in a shared environment. Data Center - Hardware Security Module (HSM) - This is probably the most common option for companies that have their own data centers. The HSM is “under your roof” and you provide the security and IT support for the device. Cloud HSM - If your data lives in the cloud and in a variety of client side applications, perhaps hosting your key server in a cloud HSM makes more sense for you. In a cloud HSM, look for two dedicated redundant HSMs in geographically diverse locations that are managed for you. Options and access will vary depending on which cloud HSM solution you deploy. With Alliance Key Manager Cloud HSM, you maintain exclusive access to your key servers. In the Cloud - If your data lives primarily in the cloud, you may want to go with a key server deployed directly in the cloud. Ways to make that option more secure would be to locate your key server in a different cloud environment from your data or even in a virtual private cloud (VPC). Cloud options are certainly cost-effective and easy to deploy, just make sure that you have a high enough risk tolerance for a shared environment! I know there are a lot of questions that each company needs to consider and answer for themselves during this security planning process. The good news is that we have solutions that can encrypt your data and protect your encryption keys in all of those locations. We offer affordable and easy to deploy solutions with what we feel is the best customer support in the industry. Check out this complimentary eBook on Key Management, then give us a call and let’s see how we can partner together to protect your data! After our latest webinar “Encryption & Key Management with Microsoft SQL Server” there were a number of great questions asked by attendees and answered by security expert Patrick Townsend. Q: Are there any special considerations when deploying an encryption key manager in the cloud? A: The cloud always presents some additional security challenges related to encryption and security in general and has the impression of being less secure and having some new challenges around security. In the cloud, the encryption key manager itself is only one component to consider, and you need a good FIPS 140-2 compliant solution like our Alliance Key Manager for SQL Server. You also need client side applications and libraries, so when you're thinking about moving to the cloud, paying attention to that particular issue is very important. Also know that not all libraries can easily migrate to cloud. We develop ours from the ground up with the cloud in mind, so all of our components that talk back to our key manager for encryption keys or encryption services are cloud-enabled and can be deployed there. From a compliance point of view, it is very important to take a look at the Cloud Security Alliance (CSA.org) document on cloud security - version 3. We also provide a compliance brief about domain 11 which talks about encryption key management and issues around the security in the cloud. Q: Can you go a little more in-depth about what gets installed on SQL Server? Side Note: We do not charge based on the number of endpoints that talk to our Alliance Key Manager. This is something that is unique to us as a vendor. We believe the encryption should be easy to do and affordable, so no additional license fees are required to actually use it. We want our customers to deploy encryption and use it to protect data. Q: What are the minimum requirements for the key server? A: The Alliance Key Manager product is available as either a hardware security module (HSM) device or virtual appliance. As an HSM it has a 1U server footprint, so it looks like any normal 1U server in your data center. However if you use our Alliance Key Manager Cloud HSM implementation, the encryption key manager is installed for you in a secure data center. It is also our philosophy that these are customer install processes, so we don't have consulting fees because it is a user deployed device. The server administration is done through a secure web browser session with our Townsend Security technical experts. The encryption key management security functions are done through a specific Windows application that talks to one or more key servers to actually create and deploy encryption keys whether they’re for Oracle or SQL Server EKM. Also, we do provide our encryption key manager as a VMware virtual appliance, which allows you to deploy a key manager within your VMware infrastructure and we give you guidance on that process. With this option you don't have to purchase a hardware appliance, you can run it in your VM infrastructure or within a vCloud architecture. We strongly recommend that a review of the PCI Security Council's - Cloud Computing Guidelines as well as their guidance around virtualization when deploying a virtual encryption key manager. Q: Does your key manager handle encryption and decryption or just key management? A: Our encryption key management appliance itself does support on-board encryption and decryption. Q: Can the same EKM module be used to encrypt servers in both data centers and cloud environments? A: Yes. You can mix and match these anyway you want. You can use the same encryption key management solution for applications running in either environment, and they can talk to each other. You should be aware of a good security practice guidance around using different encryption keys for different kinds of applications, or different user communities, even in a high-availability data center or disaster recovery centers. Q: What are the performance impacts on encryption? A: Encryption always has performance impacts. Generally it can impose a penalty somewhere between 2% and 4% in terms of computing resources. Guidance from Microsoft regarding very large SQL Server databases show that performance can become an issue with certain operations. For example, encrypted indexes may require the entire index to be decrypted in order to be processed. Very large SQL Server databases can impose a bigger performance penalty than 4%. Sometimes, cell level encryption has been a better performing implementation than transparent data encryption. We support both TDE and cell level encryption, allowing our customers to use our product as needed. We strongly recommend to our customers, especially those with larger more complex SQL Server applications, that they contact us and ask for a complimentary evaluation of our encryption key manager. The complimentary product trial is fully functional and allows an opportunity to do analysis of the performance impacts. We want you to give it a try and make sure you understand the impacts personally. Q: Is there any limit to the number of servers that you can hook up to the key manager? A: No. There's no license limit. If you're considering putting up multiple servers we recommend you engage our pre-sales support team and get some guidance on your project. You will never come to us for additional licensing fees around adding a new platform, new SQL Server, or any other application that talks to the encryption key management server. We are unique in the industry that way and is part of our philosophy; we believe encryption needs to go everywhere, data needs protection wherever it lives, and we should lower the barriers -not raise them- when it comes to getting data protection in place. You can connect as many client-side applications to the key server as you wish. Q: How do you keep system administrators from getting at the data and the keys at the same time. A: Tasks such as the management of the server, putting it on the network, establishing system logging options, setting the timeservers - all network administration processes - are segmented from the actual management of the encryption keys. Good security practice says that those should be different people engaging in those activities. We provide completely different interfaces to simplify separation of duties. If you are using our Cloud HSM environment, it is not administered, managed, or accessed by the cloud provider nor by Townsend Security. You have exclusive access and control over your encryption key managers. We even provide a path if you wish to take the encryption key manager out of the cloud environment and install it in your own data center. We believe strongly that a security device should be exclusively under your control, not under the control or management of the cloud provider. When it comes to encryption key management, only you should have access to encryption keys that protect your data. When you consider a Cloud HSM, be sure to ask if the cloud provider will have access to the HSM and your keys. The answer may surprise you! Because the encryption keys are the “secret” that protects your sensitive information, no one else should have access to your data encryption keys or to the systems that protect those keys. This is the same rule that applies in a traditional IT infrastructure and needs to be followed when you deploy data protection in a cloud environment. Not only is it a compliance requirement to protect encryption keys, but using a secure HSM is a security best practice. Are you a locked into that cloud platform? Do you have full and exclusive control of your keys? Compliance regulations are very explicit about protecting sensitive data with proper encryption key management, and recommend good key management practices as a core principle. When you move to the cloud, you don’t automatically have that level of security for your data. To meet PCI-DSS requirements for protecting credit card information you should really look at the PCI-Data Security Council - Cloud Computing Guidelines as well as their guidance around virtualization since cloud environments are virtualized environments. “Cloud computing is a form of distributed computing that is yet to be standardized. There are a number of factors to be considered when migrating to cloud services, and organizations need to clearly understand their needs before they can determine if and how they will be met by a particular solution or provider. As cloud computing is still an evolving technology, evaluations of risks and benefits may change as the technology becomes more established and its implications become better understood. It is also important to look at the Cloud Security Alliance recommendations for cloud security - version 3. Whether you are a cloud vendor or a cloud user, the CSA provides very practical and straightforward guidance on security in the cloud environment. In order to properly secure and protect vital information, you need to understand the security posture of your cloud provider. Don't be satisfied with general statements about security, look for external audits and regular expressions of compliance reviews so you know for sure that you're truly covered. Be sure your encryption keys are in geographically dispersed data centers under an ITIL-based control environment independently validated for compliance against PCI DSS and SOC frameworks to properly manage risk. Please download our latest Podcast “Encryption Key Management in the Cloud” which covers these topics in greater depth and also talks about how organizations deal with High Accessibility (HA) and Disaster Recovery when their HSM is in the cloud. The podcast will also cover our new Alliance Key Manager Cloud HSM solution that lets you protect data in Amazon Web Services, in Microsoft Azure, Rack-Space, or any cloud environment where you deploy data. 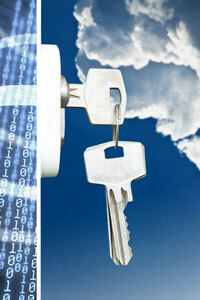 Have questions or concerns about data security in the cloud? Please leave a comment here and we will get right back to you!